Raw sprouts, also known as shoots, contain amazing nutritional value. The dry seeds contain a wide variety of vitamins, minerals, trace minerals, essential fatty acids, enzymes, phytonutrients, and I’m sure many nutrients yet to be discovered. It’s said that soaking and growing fresh shoots boosts the nutritional qualities by 300 to 1200 percent, and they contain great easily digested protein content as well. They’re easy to grow at home and can provide a great source of fresh live foods even for those who don’t have space for a vegetable garden. Sprouts have a high content of available enzymes which makes them easily digestible, except perhaps for some of the legumes can be difficult to digest without steaming. 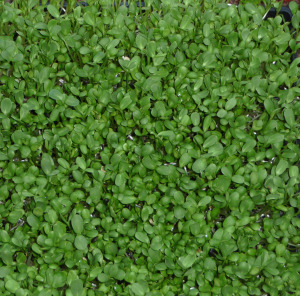 Some people do not eat young alfalfa shoots because they think they contain carayanine a substance suspected of causing ill effects by those that consume it. Green buckwheat sprouts, not the sprouted seeds, contain a substance called fagopyrin which is said to affect some people in a negative way. It can increase sun sensitivity and make people feel out of sorts. This is no reason not to enjoy the sprouts that agree with you as so many people around the world do. They have 10 to 30 times the nutrients than the vegetables they grow into which is why they are considered a true natural super food. The amazing thing is that sunflower sprouts and wheatgrass juice are said to have 30 times the nutrient value and life force of any other sprout. Now we’re at a whole other level of super foods. The Hippocrates Health Program is based largely on consuming fresh shoots and wheatgrass juice. According to Dr. Brian Clement, “Wheatgrass juice is almost pure chlorophyll, and chlorophyll functions similarly to red blood cells, thus helping to clean out our arteries. The nutrients and oxygen that chlorophyll naturally contains help flush out toxins from the human body while stimulating bone marrow to produce new cells. The foods with the highest chlorophyll content also have the highest amount of phytochemicals which aid in protecting us against disease. Of all these foods, wheatgrass has the highest content of both chlorophyll and phytochemicals. Wheatgrass – a super food, extremely high levels of chlorophyll & phytonutrients, cleanser, purifier, detoxifier, anti bacterial, blood builder, liver cleanser, rich in beta carotene and vitamin C, entire B complex including laetrile (B17),calcium, phosphorus, magnesium, sodium, potassium, contains 92 of 102 trace minerals recognized as available in plants. If you would like more in depth information on sprouting techniques, products, or to purchase seeds Steve Meyerowitz has a great website. This is the end of this list, to see other lists of raw foods go to the links below.